Cars, engines, animals and ice cream. Spot all sorts of details in the sweet, funny pictures. We just adore Sharon Rentta’s witty artwork. Nobody draws cheeky animals quite like she does. Now some clever animal mechanics with very busy paws are about to have a crazy day. An ice-cream truck has spilled its load on the motorway. All the cars are stuck, and their drivers are cross. 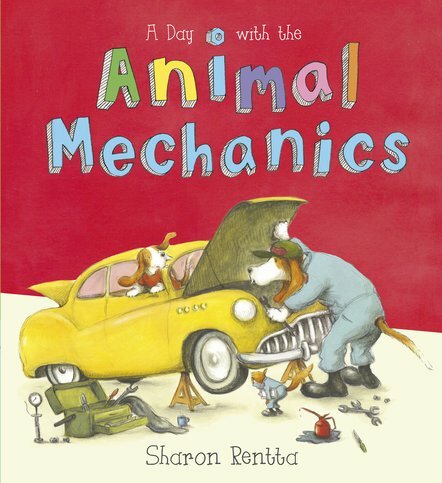 Luckily, little Dylan the dog is a trainee Expert Mechanic. He knows how to make the drivers smile. With a chocolate lolly, a twisty lolly or a yummy cornet. Nice work, Dylan: the best mechanic of the lot.